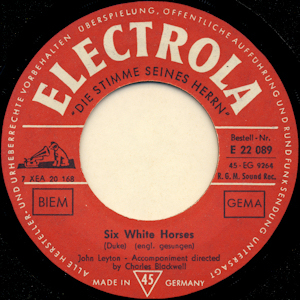 Even on Joe Meek this wave left its mark, although the outcome was modest: Only five singles with German versions were produced by Meek and his artists between 1961 and 1964, and just one of them sold fairly well. All productions from Meek's kitchen are listed below by order of artists. 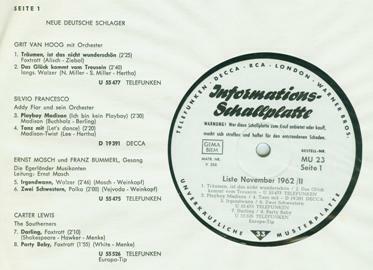 The Teldec information record shown below from November 1962 previews the forthcoming releases, bottom left this Carter-Lewis record is announced. But there are indications that it wasn't released before January or February 1963. At least this we know for sure: Party Baby is the German version of Two Timing Baby, a composition by Barry White (= Robert Charles Kingston; he also was one of the two owners of music publishing house Southern Music) with lyrics by Geoff Goddard. 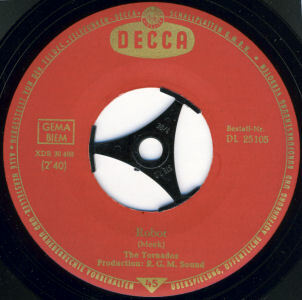 The track was released in December 1962 on the British Ember label. 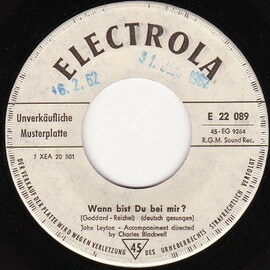 The German lyrics were written by Joe Menke. 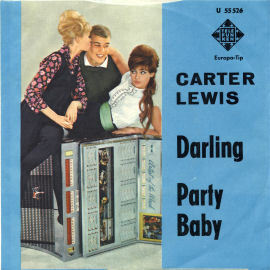 For long it was unclear whether and in which way Joe Meek was involved in the recording of Two Timing Baby and - directly or indirectly - the German version, Party Baby. (Definetely Meek didn't have anything to do with side A, Darling.) John Carter himself stated in an interview: "The Ember tracks were recorded at Joe Meek's studio in Holloway Road and engineered by Joe." Please note he says "engineered by Joe", not "produced by Joe" - and we can be sure that as a full professional he knew the difference between both. 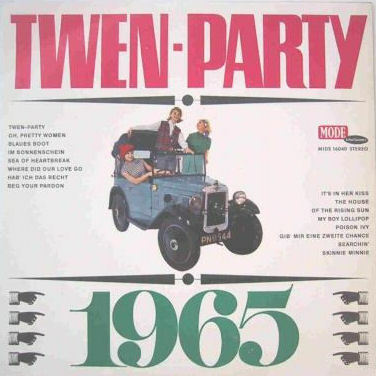 Producer of the recording was indeed Terry Kennedy, Joe Meek attended as balance engineer. The sound lacks too much of reverb and compression to be a real Meek production. What is still unclear is whether Two Timing Baby has been recorded at Meek's studio or elsewhere. 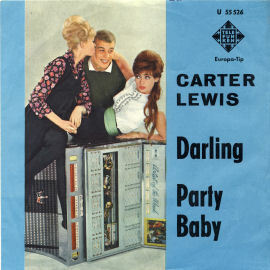 Carter ascribed it to Meek's, but on the other hand no one less than Ember boss Jeffrey Kruger himself stated to the Joe Meek Page that he is sure the track has not been recorded at Joe Meek's studio. Today, after nearly fifty years, it'll be probably impossible to clear who's wrong. Even more hard to cope with is Party Baby, the German version. In the original version we hear - besides John Carter and Ken Lewis - Albert Lee on guitar, Chas Hodges on bass, Bobby Graham on drums and Geoff Goddard on piano. 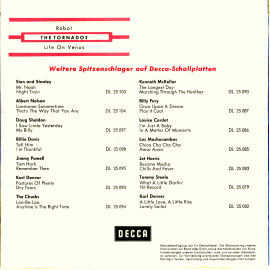 It is possible that the backing tape (or an earlier production stage) of Two Timing Baby has been used for Party Baby, but for two reasons it's rather unlikely: First, the GEMA list of works names a sub-arranger, Erich Sendel, which wouldn't make much sense if the original backing tape had been used. And secondly the sound of the German version compares even more badly against the original (which in itself already is not very "meekish"). Unfortunately it's not possible anymore to find out where and under which producer the German version has been laid down. So probably we will never know exactly whether there are trace elements of Meek's contribution audible. Questions like these may sound a little bit exaggerated, but please see: If a record can be definitely assigned to Joe Meek, its collector's value increases on the spot. That's why some second hand or internet auction dealers have a vested interest to declare unsettled productions like this as safe Meek productions. Carter & Lewis, by the way, later built up The Ivy League, who again changed into The Flowerpot Men. In 1967 they became a classic "one hit wonder" with Let's Go To San Francisco. John Carter's voice can be heard on Winchester Cathedral by the New Vaudeville Band (1966); because he didn't want to tour anymore he reduced his activities to songwriting. Some hits he penned were Knock Knock Who's There? by Mary Hopkin (1970), Dreams Are Ten A Penny by Kincade (1973) and Beach Baby by First Class (1974). Under his real name John Shakespeare he wrote film soundtracks, besides this he composed several advertising jingles. Ken Lewis (= Kenneth James Hawker) went on writing songs with John Carter for a while, among others Is It True? for Brenda Lee and the U.S. #1 hit Can't You Hear My Heartbeat for Herman's Hermits (1965). He later came down with depressions and retired into private life in 1971. 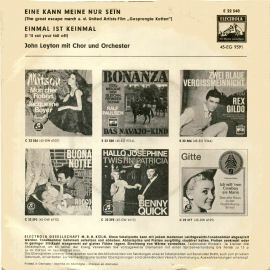 Promotional copy in a neutral sleeve only for promotional use. 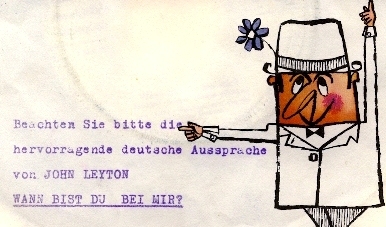 The inserted hectograph reads: "Please note the outstanding German pronunciation of John Leyton". Son This Is She is a Leyton classic with mystical lyrics, an angels choir as sweet as sugar and a Bolero rhythm which strongly reminds to Roy Orbison's ballads of destiny. Music and lyrics were written by Geoff Goddard; Karl-Heinz Reichel provided the German lyrics. There's a French version too: John, c'est l'amour; it's not possible to find out who wrote the French lyrics. However, the French version never appeared on any record fair and no label scan has ever been seen. So it is well possible that it has never been released on record. Both versions, the German and the French one, are lyrically as well as tonal and technically weaker than the original. Both have been recorded during the same session in December 1961; conducted by Charles Blackwell, who already did the original arrangement. A listening comparison with the English version shows that assumingly the tune has been re-recorded, maybe based on an early production stage of the original playback. Linguistically, Leyton was coached by Mike Sarne (= Michael Scheur), who also did the phonetical transcription of the lyrics. 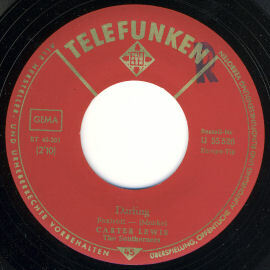 The record failed to enter the German charts. 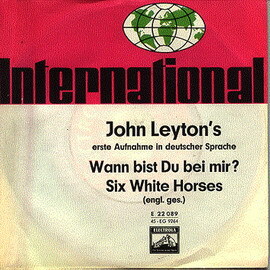 The flip side, Six White Horses, is the original version in English language. The A-side has been written by no less than the famous film composer Elmer Bernstein (and in fact the original song is part of a film score), but Leytons vocal version is definitely an opus from the museum of oddities. 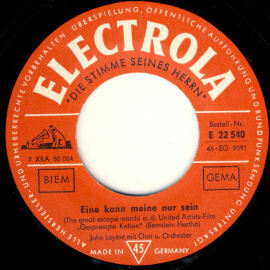 The German lyrics were written by Kurt Hertha. 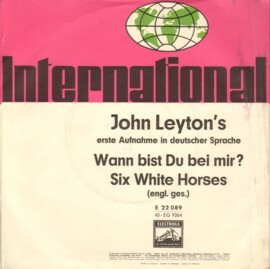 The B-side is on the same level; music and lyrics have been written by Johnnie Worth (= Les VanDyke; under this name he provided a couple of hits for Adam Faith), the German lyrics were done by Jean Nicolas (= Camillo Felgen). One has to pay a compliment to the German lyricists, they hit the spirit of the original lyrics on the spot in both cases. Technically, there is no big difference between these recordings and the English originals. Apparently the original backing tapes were used, and we may assume that the German vocals were recorded at Meek's studio. Again, Leyton was coached linguistically by Mike Sarne (= Michael Scheur), who also did the phonetical transcription of the lyrics. 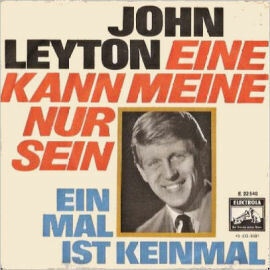 As its predecessor, also this record failed to make it into the German charts, and it was John Leyton's last try to sing in German language. 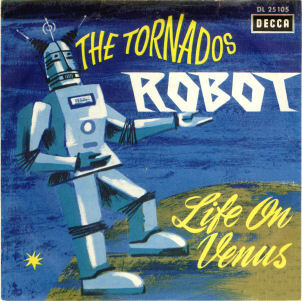 The German edition of Life On Venus has an intro in German language: "Hallo, hallo, hier Tornado X-13. Empfange soeben Signale von der Venus, die sich wie Orgelmusik anhören. Es ist somit möglich, dass es auf der Venus Lebewesen gibt!" It is unknown whether this was originally Meek's idea or has been made at the instigation of the German record company Teldec. Moreover, it's not possible anymore to find out who the speaker was. 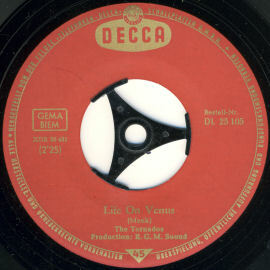 The original version of Life On Venus with the English-spoken opening text was not released in Germany. 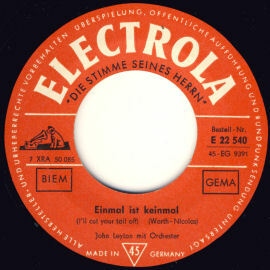 The German vocals for both tracks were recorded at Meek's studio using the original backing tapes. 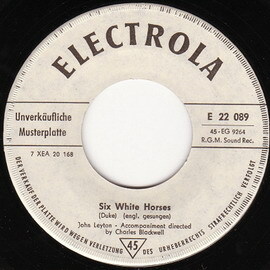 The mastering, however, was done in Germany, that's why in both songs Meek's follow-up treatment is missed. It's hard to say why he didn't do it - maybe he considered it too large-scale to do the trampling on the stairs a second time, or maybe he simply wanted to avoid a repeated quarrel with his landlords, who had massively complained about the noise in the stairwell. However, this is why the German versions are now a unique possibility to hear the sound of the band without Meek's follow-up treatment. The difference is stunning. 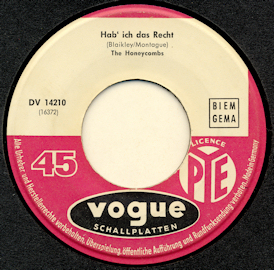 Because of the missing speed-up, the German versions were longer than the English originals, so that one verse of Hab ich das Recht had to be removed - with the result that now the song is 25 seconds shorter than the original. In case of the B-side the longer duration (about 20 seconds) was accepted. In Wikipedia, the German lyrics of Have I The Right are wrongly ascribed to Camillo Felgen; obviously a mix-up with "Lee Montague", a pseudonym he sometimes used. 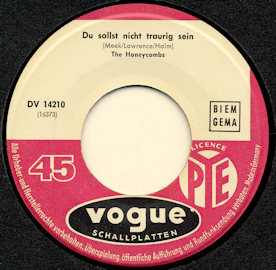 Actually, the German lyrics were written by Lawrence Montague (= Lawrence "Larry" Yaskiel, at that time managing director of Vogue Schallplatten in Königswinter, later he runned the German branch of Robert Stigwood Organisation (RSO) and an agency named Antenna in Hamburg); he also coached the singer doing the German vocals. 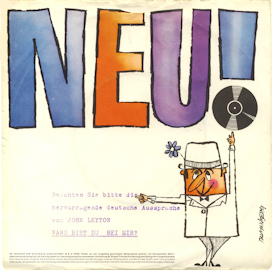 The lyrics for Du sollst nicht traurig sein were written by later schlager singer and producer Michael Holm (= Lothar Bernhard Walter; in the eighties he became internationally known with his new age music project Cusco). As for the rest, the GEMA data bank names Herbert Gabriel as musical sub-arranger, but it's not possible to find out what he actually did - maybe the editing. 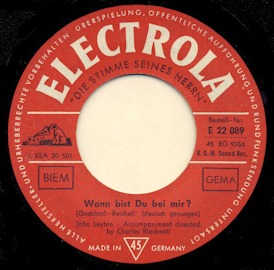 The original version of Have I The Right entered the German charts on October 3rd, 1964, and stayed there for 14 weeks; the highest position was #21. 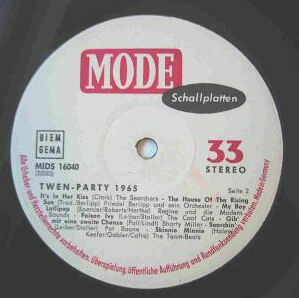 The German version followed on November 14th and stayed for nine weeks, it peaked at #21 too. 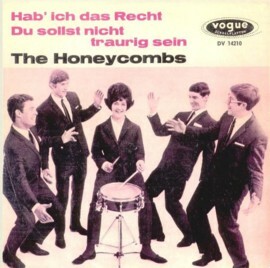 Sampler, containing the Honeycombs track in German language.